Our artisan goat milk products are all natural and are mixed with organic herbs to enhance the taste, touch, and smell that is rarely met by traditional mass-produced products on the market today. There are no preservatives in any of our products. View Our Products. The Toggs' chevre cheese is light and smooth with the right hints of herbs and spices that goes well with most any food pairings. Use simply on crackers with a confetti of chopped veggies, on a pizza or mix with your favorite dishes such as curries and chili. There are no preservatives in our cheese. The artisan soap we create from the goat milk often use many natural plant products that we source locally in the markets found near Yuma or our own farm. We use aloe, rose petals, and lavender. We also mix additional ingredients with our soaps such as oatmeal, jasmine, pumpkin, mango, and coconut and cocoa butters to enhance the natural cleaning and moisturizers found in our goat milk. Our artisan lotions are all natural and contain no preservatives. The lotions moisturize and are known to heal dry and chafed skin. They contain almond oil, avocado oil, water, stearic acid, emulsifying wax, raw shea butter, fragrance, and of course, goat's milk. We have many fragrances and if you need a fragrance and we don't have it, we will make it, just for you. 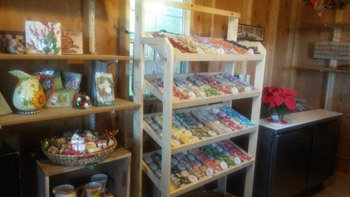 Goat Soap: This is our line of Toggenburg soap made from all natural products including goat's milk, plant products such as rose petals, aloe, and coconut to list a few. These soaps are approximately 4 ounces in size and range in varying shapes including seashells, stars, and traditional blocks. Our lotion does contain milk, so it's best to keep out of the sun and away from extreme heat. The lotions are solid in 3oz and 8oz sizes. They contain the same fragrances as our soaps. Our Chocolate goat milk fudge is always fresh. Made with goat milk, sugar, vanilla, chocolate chips, butter and marshmallow cream. It is Delicious!